We shed some light on 3 features of this basic options strategy: selling stock, collecting dividends, and limiting taxes. What draws investors to a covered call options strategy? Giving someone the right to buy your stock at the strike price in exchange for a few more greenbacks, baby. Covered calls are potential income earners on stocks you already own. Of course, there is no free lunch; your stock could be called away at any time during the life of the option. Selling or “writing” covered calls has many potential uses besides just being a way to potentially generate income that many investors don’t fully realize. Let’s take a look. 1. Exit a long position. What may be one of the most underutilized ways to sell your stocks is by using a covered call strategy. If you already plan to sell, you might as well consider taking advantage of the potential to receive some additional income for your efforts. Here’s how it works: Let’s say that XYZ stock is trading at $23 a share, and you want to sell your 100 shares at $25 per share. Sure, you could probably sell your XYZ shares right now for $23 per share in your brokerage account, but you could also sell (write) a covered call with your target price (strike price) of $25 a share. If you sell the call, you’ll receive cash (premium), which is immediately deposited into your account (less any commissions and contract fees). The cash is yours to keep no matter what happens to the underlying shares. If XYZ rises above $25 or higher before the option expires, you’ll likely be assigned on your short option and your shares of XYZ will be called away from you at the strike price. In fact, that move fits right into your plan. You received premium for selling the call, and you also made an additional 2-points (from $23 to $25) on the stock. As desired, the stock was sold at your target price (i.e. called away from you) at $25. If the stock goes higher than $25, you made what you wanted, but not a penny more. After all, you agreed to sell XYZ at the $25 strike price. You pocketed your premium, and made another 2 points when your stock was sold. But you won’t participate in any stock appreciation above the strike price. Also, keep in mind the transaction costs (commissions, contract fees and option assignment fees) will reduce your gains. ON THE OTHER HAND—In our example, although you would like to sell XYZ at $25, it’s possible that the stock price could fall from $23 to $20 or even lower. In this case, you still get to keep the premium you received and you will still own the stock on the expiration date, however, instead of the 2 points you had hoped to attain, you’re now looking at a potential loss, (depending on what price you originally bought XYZ at). In other words, there is some downside protection with this strategy, but it is limited to the cash you received when you sold the option. HINT—Many options traders spend a lot of time analyzing the underlying stock in an effort to avoid unwanted surprises. They use that research to try to improve the odds that they choose stocks that won’t suffer a serious, unexpected price decline. Keep in mind no matter how much research you do, surprises are always possible. HINT—Any time your covered call option is “at-or in-the-money,” your stock could be called away from you. And the deeper your option is “inthe- money” during the lifetime of the option, the higher probability that your stock will be called away from you, and sold at the strike price. KEEP IN MIND—If your option is in-the-money by even one penny when expiration arrives, your stock would very likely be called away. A strategy in which a call option is written against an equivalent amount of long stock. A “call” gives the owner the right to buy the underlying security at a specified price (strike price) for a certain, fixed period of time (until expiration). Selling a covered call is also known as “writing” a covered call. While a position remains open, the writer is subject to fulfilling the obligations of that option contract. Describes an option with intrinsic value. A call option is in-the-money if the stock price is above the strike price. A put option is in-the-money if the stock price is below the strike price. A covered call position in which stock is purchased and an equivalent number of calls written at the same time. is a measure of an option’s sensitivity to changes in the price of the underlying asset. is a measure of delta’s sensitivity to changes in the price of the underlying asset. is a measure of an option’s sensitivity to changes in the vola- tility of the underlying asset. is a measure of an option’s sensitivity to time decay. 2. Sell covered calls for premium, potentially continue to collect dividends and capital gains. Selling covered calls can sometimes feel like you’ve made a triple play. After you sold a covered call on XYZ, you collect your premium and you can still continue to receive dividends and capital gains on the underlying stock unless the stock is called away. That’s the good news. ON THE OTHER HAND—The option buyer (the person who agreed to buy your option) is not dumb. He or she may also want that dividend, so as the ex-dividend date approaches, the chances that your stock will be called away from you increase. HINT—The option buyer (or holder) has the right to take that stock away from you anytime that the option is in-the-money. You still keep the premium and any capital gains up to the strike price, but you could lose out on the dividend if the stock leaves your account prior to the ex-dividend date. HINT—Not surprisingly, some option buyers will exercise the call option prior to the ex-dividend date to capture the dividend for themselves. And if the option is deep in-the-money, there’s a higher probability the stock will be called away from you before you get to collect the dividend. Anytime you sell a call option on a stock you own, you must be prepared for the possibility that the stock will be called away. When you sell a covered call, you receive premium, but you also give up control of your stock. KEEP IN MIND—Only options that are in-the-money would likely be exercised to collect the dividend. 3. Potential tax advantages in selling covered calls. There may be tax advantages to selling covered calls in an IRA or other retirement account where premiums, capital gains, and dividends may be tax-deferred. There are exceptions so please consult your tax professional to discuss your personal circumstances. Now, if the stock is held in a taxable brokerage account, there are some tax considerations. For example: Let’s say in November you have potential profits on XYZ stock, but for tax purposes, you don’t want to sell. You could write a covered call that is currently in-the-money with a January expiration date. Special rules apply to calls that are written “deep in the money” so please consult your tax professional to discuss your personal circumstances and the special rules. If all goes as planned, the stock will be sold at the strike price in January, in a new tax year. Remember, you’re always accepting the risk, no matter how small, that your option will be assigned sooner than you planned. You could even be assigned on that in-the-money call the day after you sold it. The result could be that you sell the stock and take a profit in the very year you wanted to avoid. One way to reduce that probability but still aim for tax deferral is to write an out-of-the-money covered call. FOR EXAMPLE—Let’s say in November you have potential profits on XYZ stock, but for tax purposes, you don’t want to sell. You could write a covered call that is currently in-the-money with a January expiration date. If all goes as planned, the stock will be sold at the strike price in January, in a new tax year. Remember, you’re always accepting the risk, no matter how small, that your option will be assigned sooner than you planned. One way to reduce that probability but still aim for tax deferment is to write an out-of-the-money covered call. ON THE OTHER HAND—If the stock falls rather than appreciates, you will likely still be holding the stock, and the call option will expire worthless. In this example, you could always consider selling the stock, or sell another covered call. Nevertheless, a risk of hoping to get assigned on a covered call is that the underlying stock may fall and never reach your strike price, a scenario you must always anticipate. HINT—Given a choice between paying taxes on a profitable stock trade and paying no taxes on an unprofitable stock trade, most people would rather pay the taxes. But that is a choice only you can make. HINT—If you believe that the benefits of selling covered calls outweigh the risks, you might look for stocks that you consider good candidates for covered call writing. A buy-write allows you to simultaneously buy the underlying stock, and sell (write) a covered call. KEEP IN MIND—You will likely pay two commissions, one for the buy on the stock and one for the write of the call. 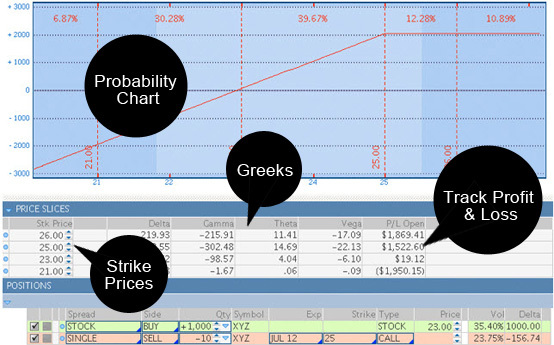 The key to avoiding the misuse of basic options strategies such as covered calls is education, research, and practice. Remember, any options strategy can only be right for you if it is true to your investment goals and risk tolerance. FIGURE 1: Sample trade shows purchase of 1,000 shares of stock and sale of 10 calls. This example does not include transaction costs. Investors must consider the effects of transaction costs before placing options trades. Probability analysis results are theoretical in nature, not guaranteed, and do not reflect any degree of certainty of an event occurring. For illustrative purposes only. Past performance does not guarantee future results. Fundamental or technical analysis? You don’t have to choose. A combination can help with potential entries and exits. Which is better, fundamental or technical analysis? For traders and investors, this debate may rival the classics: Hatfields & McCoys or cats vs. dogs. There can be subtle or profound differences, depending on who you ask. Fundamental trading is a little more “art.” That is, subjective (See Figure 1). Past company earnings are fact. Yet, where company profit might be headed is anyone’s “educated” guess. Or, take share-price valuation. It’s based on math, but also requires that traders check their gut before jumping. 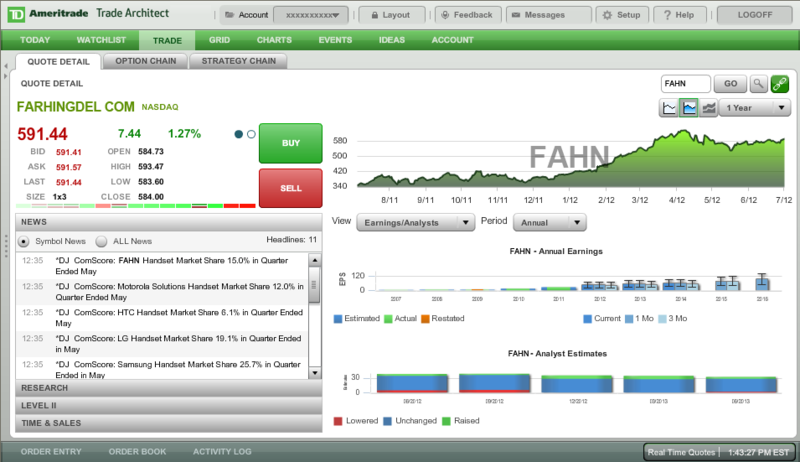 FIGURE 1: A quote detail on TD Ameritrade’s Trade Architect platform provides news, earnings, analyst estimates for upcoming quarterly results, and more. For illustrative purposes only. Past performance does not guarantee future results. Data: Penson Worldwide, Inc.
Technical trading (the “science” for our purposes) hinges less on why a market is performing the way it is and more on what a chart shows at a particular time. Like any science, this method isn’t fool proof either. Below, two active home-based traders invite us for a peak over their shoulder. One considers herself a fundamentalist who leans on chart readings for support. The other is a technician who generates trading ideas by skimming the fundamentals. Study their research methods, analysis, and chart tricks, but keep in mind, their level of expertise or particular approach may not be the best fit for your goals and risk tolerance, or it may contradict your own preferred style. Still, you’ll get an idea of how a fundamentalist works versus how a technician works. In reality, you’ll likely find that both mix a little art and science. Why take this approach? “You wouldn’t walk onto a golf course with only half your clubs. To get my own reading of what a stock is worth, I combine both,” said Toni. 5:30 A.M. ET I begin my research by checking the stock index futures, the Asian and European markets, or choosing a sector or industry group that, as I see it, has a chance of advancing (or declining) in the current market environment. Once I focus on a sector or industry, I create a watch list of five or six equities. Once logged in to tdameritade.com, I open Research & Ideas > Stocks. I’ll check the overview page on each stock, and check the earnings per share, the price/earnings (P/E) ratio, and the annual dividend and yield. For position trades, I tend to like value stocks with dividends. If a company has an extremely high P/E ratio, then I will probably avoid that stock no matter what the technicals tell me. Why? Because if the market takes a sudden downturn, over-priced stocks with poor fundamentals are potentially “shorting targets” of hedge funds. I check out how my target company compares to the same industry group and I see what analysts are saying. Within ten to fifteen minutes, I can usually learn a tremendous amount about my target stocks using both technical and fundamental analysis. If my stock has good fundamentals, it probably has big institutional support. And if it has crummy fundamentals, it could be one of the first stocks to potentially fall in a downturn. 8:00 A.M. Using technical analysis, I go through the daily charts of each of my target stocks. When I find a setup on the daily chart that I like, I’ll flip that daily chart to a weekly chart because the buy-and-sell signals on a weekly or monthly chart are stronger than on a daily chart. If my weekly chart confirms it is indeed a buy signal, then I go into my TD Ameritrade account and read fundamental research. I am interested in earnings growth over the last four quarters, and also projected earnings growth. For me, the most important piece of information on the fundamental side is earnings. It only takes a few seconds to check this. 9:00 A.M. Now that I have an overview of the fundamentals, I look at setups using moving averages (MA), such as the 10-day, 21-day, 50-day, and 200-day. I like my target stock either in an uptrend or forming a base, and consolidating in a neat, orderly pattern. I’m looking for a stock that could break out of this pattern. If the stock on a daily candlestick chart (See Figure 2) has long shadows on the top or bottom of its body, that indicates intraday volatility, and I might remove that stock from my buy list. I’m not interested in a stock that has high intraday volatility if I’m swing trading. In that case, I prefer ordering patterns. Even if fundamentals are good but my stock is trading below its major moving averages, and indicators such as Relative Strength Index (RSI) [See The Chartist in the June issue for more on RSI] are pointing down, I’m not going into it. I use technicals for entries, and fundamentals to confirm them. 9:30 A.M. The only opening-bell trades I make are taking profits in positions that gap up from the night before, or if I need to make an emergency exit. FIGURE 2: The “candlestick” for each trading day marks the high, low, open, and close. From there, moving averages and volatility can be tracked. For illustrative purposes only. Past performance does not guarantee future results. Data: Penson Worldwide, Inc.
11:00 A.M. During the day, I’ll look at economic reports due to come out the next day. I might also take some profits off the table on intraday trades. 1:30 P.M. I’ll continue scanning daily, and 5-minute, charts for strong stocks in an uptrend (or downtrend for down days) that have pulled back from their session highs. I’ll focus on the stocks that are closing in on their highs (which is reversed, if shorting). 1:45 P.M. I might add a little money to open positions depending on the mood of the market. I’m still looking for potential profit-taking opportunities. 3:15 P.M. Before the 4:00 p.m. EST market close, I want to cash in on profits before other traders exit and drive prices down. Deron primarily sticks to technical analysis, focusing on RSI (See Figure 3). He uses fundamental analysis to find stock candidates. “For my own trading, technical analysis tells me everything I need to know about deciding my bias on the direction a stock is going: up, down, or sideways. My number one indicator is price. Volume is second,” said Deron. 9:00 P.M. ET The night before a given trading day, I filter through 300 to 500 charts that meet my trading criteria. 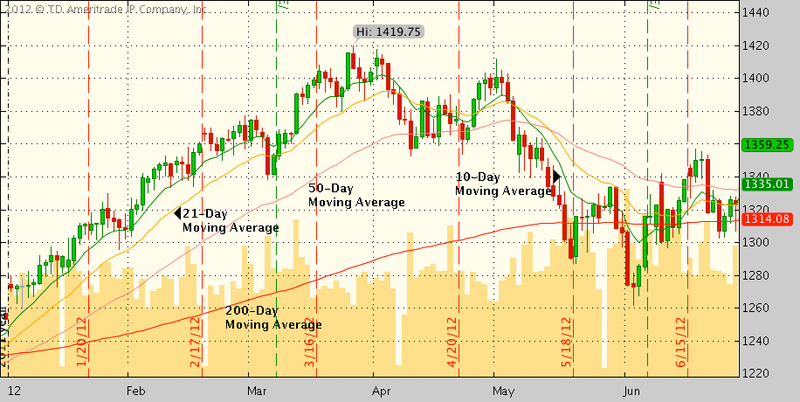 I like stocks that are consolidating after making highs for at least several weeks, which form bullish chart patterns. The stocks that I think will be the strongest will probably be the ones with strong earnings. Other than earnings, I don’t really care about P/E ratios or other fundamental data, because I think it doesn’t determine the price action of a stock in the near term, and I’m primarily a short-term trader. 7:30 A.M. In the morning, I check out the U.S. futures market and study the Asian and European markets for breaking news. 8:00 A.M. I look for potential gaps in the stock positions on my watch list, or any stocks I’m already in. Then I look at economic data, and check for analyst upgrades or downgrades. Finally, I create a game plan, which helps me to know exactly what I will buy or sell using my target prices. By 9:15 a.m., all of my information is collected and I’m ready to start the trading day. 9:30 A.M. I am managing positions—that is, buying and selling stocks. Meanwhile, I am filtering through the stocks on my watch list (a very short list) to make sure I don’t miss any entries. On the long side, I look for stocks showing relative strength to the broad market. 11:30 A.M. I go over any stock positions to see how they traded during the morning session. I determine if I need to adjust any stops or change position size. 2:15 P.M. Because, as I see it, this is often a reversal period, I keep an eye out for potential sharp reversals. 3:30 P.M. Near the end of the closing day, I check to see where the stocks I own close. If I don’t have many positions, I scan my nightly watch list to see how the stocks performed during the day. 4:00 P.M. At the market close, I log my trades into a spreadsheet and analyze profitable, or unprofitable, positions. Deron, in fact, finds a little art and science within technical trading. “In my opinion, technical analysis is probably 70% science and 30% art. The art is learning how to translate what you see into deciding whether to buy or sell. The science part of technical analysis is really the personal trading rules, which; for me, are already in place,” he said. The bottom line: Both approaches offer strengths and weaknesses. Combining fundamentals with a solid charting skill set may become a more popular way for traders to call it as they see it. MIAMI, Fla. (MarketWatch) — Although this column is primarily about trading, I’ve also interviewed and learned from hundreds of longer-term investors. Successful traders and investors often have similar goals: manage risk; diversify, and learn to control emotions. The main differences are the tools they use and how long they hold a position. John Bogle: When I interviewed Vanguard Group founder John Bogle for my first book, his most useful advice was “stay the course.” He told me that people are the most optimistic when the market is at an all-time high, and most pessimistic when it’s at an all-time low. “Time is your friend, impulse is your enemy,” Bogle said. Bogle is a huge proponent of diversification, and also advised holding stocks in an amount that lets you sleep at night. “Sell down to the sleeping point,” he said. William O’Neil: He explained how to manage risk. When first entering a position, he often buys half of a normal position, and adds a little to it if the stock goes up. O’Neil’s most useful advice to me: Make bigger money when you’re right, and cut losses when you’re wrong. O’Neil, a veteran trader and founder of newspaper Investor’s Business Daily, also stresses that you do not always need to be in the market. Knowing when to lock in gains and move to the sidelines is just as important as knowing how to capture gains in the first place. Peter Lynch: I learned from Peter Lynch that if you understand what you own, and what the company does, you won’t panic if the market or your stock goes down. The former Fidelity Magellan Fund manager doesn’t panic during bear markets, and takes them in stride. John Templeton: In 1998, while doing research for a book, many sources spoke highly of legendary stock investor Sir John Templeton. So I picked up the phone and spoke to his secretary, who gave me his number in the Bahamas. I was surprised when Sir John answered the phone. I spoke with him for 15 minutes and asked if he’d agree to a longer interview. He politely declined. The lesson I learned: First, do your research. Second, be prepared for anything. Unfortunately, I learned this on my own, because I don’t remember one thing Sir John told me about the stock market. I wasn’t recording the conversation and I didn’t take notes. Why? Because I didn’t fully appreciate to whom I was speaking. Calling Sir John was similar to speaking with Warren Buffett on his private line. Now, before I do any interviews, I do my research, and I am prepared for any possibility. I have applied these same lessons to investing or trading in the stock market. I don’t invest or trade in a stock, bond, or option unless I’ve done my homework. 1. Begin by paying off all your debts. 2. After being debt-free, you must not be tempted to blow your money on risky financial adventures. 3. It is hard enough for most people to earn a bare living, including 95% who are unable to keep and acquire a fortune. This is not to discourage you but to warn you and give you courage to fight harder to be one of the 5%. 4. Always be prepared for the possibility that you may have to support your parents. In addition, you owe it to your spouse and your family to buy life insurance. 5. You want the privilege of helping those who are afflicted and impoverished. 6. The most important measure of success is integrity, hard work, and being right more than 55% of the time. This also means diversifying risks so that when you are wrong it won’t break or crimp you. 7. Never co-sign promissory notes to help others. 8. Never buy stocks in small corporations to please friends — easy to buy, hard to sell. 9. Don’t be easy in loaning money except in extreme cases (i.e. don’t let down a worthy friend). 10. Only hard experience, proven by fact, should impress you and cause you to follow the rules just outlined. In addition to this common-sense advice, I also learned that the simplest strategies are often the most successful. Warren Buffett famously said that he doesn’t invest in anything he doesn’t understand. Stick to strategies you know and understand. Most important, be aware of your emotions. If you’re too bearish, you’ll miss out on profitable investing opportunities. And if you’re too bullish, you’ll be unprepared for worst-case scenarios. Getting too emotional about the market may cloud your judgment and damage your portfolio. Whether an investor or trader, it’s important to create target prices for buying, selling, and emergencies. Stop-losses can be mental or manual, but know in advance when to get in or out. Finally, it’s a personal choice whether to use technical, fundamental, or sentiment analysis. But no matter how you analyze the market, get out of a stock when you’re wrong, and stay in when you’re right. It’s easier said than done, but essential for stock market survival. Begin by paying off all your debts. After being debt-free, you must not be tempted to blow your money on risky financial adventures. It is hard enough for most people to earn a bare living, including 95% who are unable to keep and acquire a fortune. This is not to discourage you but to warn you and give you courage to fight harder to be one of the 5%. Always be prepared for the possibility that you may have to support your parents. In addition, you owe it to your spouse and your family to buy life insurance. You want the privilege of helping those who are afflicted and impoverished. The most important measure of success is integrity, hard work, and being right more than 55% of the time. This also means diversifying risks so that when you are wrong it won’t break or crimp you. Never co-sign promissory notes to help others. Never buy stocks in small corporations to please friends — easy to buy, hard to sell. Don’t be easy in loaning money except in extreme cases (i.e. don’t let down a worthy friend). Only hard experience, proven by fact, should impress you and cause you to follow the rules just outlined.